A telephoto zoom is the second most important lens in a high percentage of camera kits and the 70-200mm focal length range is both ideal for many uses and extremely popular. Add in a wide f/2.8 aperture with Vibration Compensation and the telephoto lens becomes especially versatile, ready to tackle low light venues. This is not Tamron's first (or even second) 70-200mm f/2.8 lens and with the G2 Lens, Tamron promises "... enhanced optical performance, improved VC (Vibration Compensation), faster AF speed and accuracy, and shortened MOD (Minimum Object Distance) for greater flexibility." It is not hard to appreciate any of those features and the greatly-modernized design is attractive from both aesthetic and functionality perspectives. Overall, this lens is a great performer and for many, the relatively low price will win the choice for this lens. What is a 70-200mm lens useful for? The list of uses for a short-mid-telephoto focal length range is very long, but I'll start with the perhaps most-popular use and that is portraits. And I'll start the portrait discussion with a comparison look at this focal length range (another focal length range example will be provided in the linear distortion discussion later in the review). At the wide end of this range, head and shoulder portraits show a nice perspective as do any portraits captured from longer distances. At 200mm, even very tight headshots retain a nice perspective for a great look, one that typically includes few discernable background subjects. 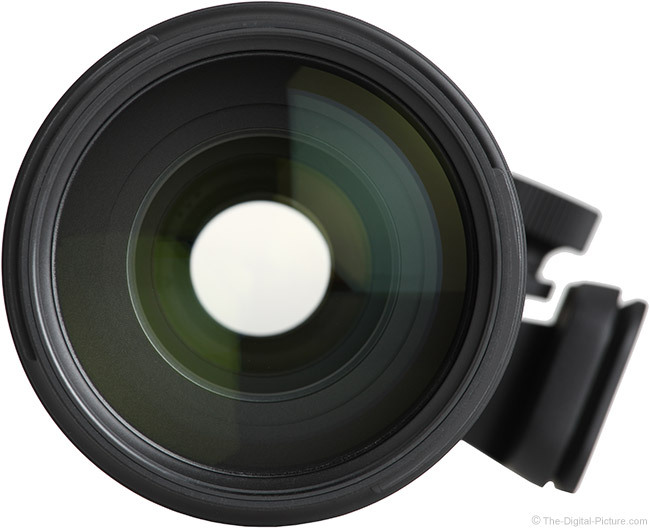 With this lens, people can be photographed in the home, in the yard, at the beach, at the park, in the studio or at a wide variety of events and venues, and this focal length range is frequently a first choice for all of these. Very popular event use includes weddings, performances (including kids on stage) and speaking engagements. The above is a slightly-cropped 200mm image. People are also frequently photographed participating in sporting and other action scenarios with this focal length range. While the 200mm focal length may be modestly too wide for large field sports photography, it works very well for closer action such as that found at track and field meets and on the basketball court. Basketball is typically played indoors and with the f/2.8 aperture (more on this soon), indoor action sports are within this lens' capabilities. By virtue of the longer focal lengths and aided strongly by the wide f/2.8 aperture, the background of 70-200mm images can be diffusely-blurred and that attribute is especially great for portraits where the background cannot be fully controlled, including at sporting events and performances captured from a seat in the audience. If you want to make money with a camera, photographing people is often one of the easiest ways to accomplish this and this lens, easily covering the classic portrait range of 85mm through 135mm (after FOVCF is factored in) is ideally suited for this purpose. While portrait photography generally refers to images of people being captured, some of us also refer to certain types of wildlife photos as portraits. These images typically include the animal at least nearly filling the frame and for that task, this focal length range often falls short of that need. Unless the wildlife subject is very large and/or very close, the longest native focal length in this lens (I'll discuss the teleconverter options later in the review) will usually be found far too short for this task. If capturing environmental wildlife portraits or captive (zoo) wildlife, this focal length range may be perfect. Another great way to deploy telephoto lenses for landscape photography is to focus on closer details, allowing a strong background blur to isolate those within the image. A 70-200mm lens is my most-used studio lens, working especially well for product images and many other general studio applications. Mount a 70-200mm lens on an APS-C-format camera and the angle of view (AOV) becomes like that of a 112-320mm lens on a full frame camera. While the narrower AOV does not greatly change the uses list for this lens, these AOVs make widely-framed portraits less ideal and most will prefer this AOV range for sports and wildlife pursuits. I've hinted to the wide aperture this lens has and the fixed f/2.8 max aperture available over the entire focal length range is indeed a big asset. What are the advantages of a wide aperture? 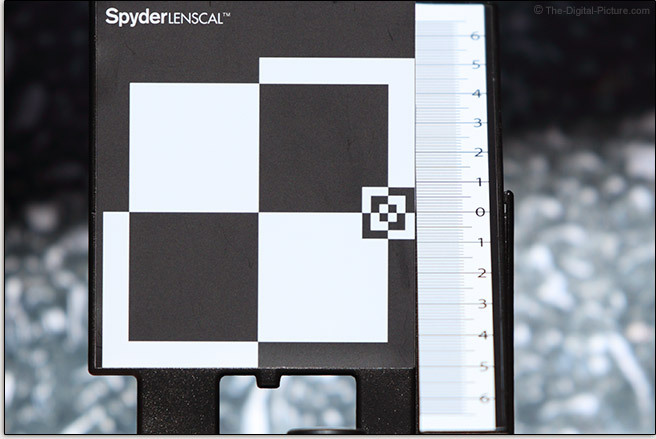 More light reaches the imaging sensor and it provides a shallower, better-subject-isolating depth of field. While those photographing landscapes with this lens may not find the wide f/2.8 aperture mandatory (and those hiking to remote landscape destinations may not appreciate the weight that accompanies an f/2.8 lens), those capturing portraits or photographing low light events, including sporting events, definitely will. The f/2.8 aperture represents the widest aperture available in a 70-200mm zoom lens and, even with the improvements we've seen in DSLR camera high ISO performance, f/2.8 remains the minimum aperture I want to have when photographing indoor activities. The wide aperture invites stopping action in low light and handholding the camera in perhaps even lower light levels. This is the specific aperture required to enable the higher precision AF capabilities (most often the center AF point) in some cameras, further aiding in ideal image quality. Another f/2.8 advantage is the bright viewfinder image it makes available. What are the disadvantages of a wide aperture? I already mentioned the weight and increased size that goes with this attribute. The other wide aperture disadvantage one can count on is increased price over similar focal length lenses with narrower apertures. From my perspective, the advantages far outweigh the disadvantages. While the wide aperture alone makes this lens a great choice for low light photography, this lens' VC (Vibration Compensation) system significantly increases its versatility, improves its usability and, in many situations, greatly improves the image quality it delivers. The prior version of this lens (we'll call it the G1) also had VC, but it was rated one stop lower than the incredible 5-stop CIPA rating given to the G2, theoretically making the G2 handholdable in 1/2 as much light. In practice, under ideal conditions, using an ultra-high resolution Canon EOS 5Ds R, most of my 70mm images were sharp at 1/8 second exposures with a taper off in keeper rate through 1/4 second. An infrequent sharp image was obtained at longer shutter speeds, but the success rate was very low. A decent percentage of 200mm results were sharp at 1/13 - 1/10 second, but the keeper rate rapidly dropped at longer exposures. For me, these figures are an improvement over the G1, which needed similar exposure times for sharp images from a much lower resolution Canon EOS 5D Mark III. Photographing outside, perhaps in the wind or on unstable footing? Expect to need faster exposures than those I reported. But, also expect a similar amount of assistance from VC as it is still similarly and significantly compensating for shake. While VC is great for reducing camera shake in images, it is also very helpful for framing subjects while taking photo. While I do find this VC system to fight with me slightly for very critical framing (in Mode 1), having the viewfinder view stabilized permits the shutter release to be timed with the just-right composition. In this system, the image in viewfinder remains very stable when VC starts. Some light chatter is heard when VC is activated and again when it is deactivated, but it is hard to hear the light humming and clicking when VC is running unless an ear is immediately next to the lens. Drifting of the subject framing while VC is active is sometimes noticeable and can be a little annoying while waiting for the right moment to release the shutter. Mode 1 is designed for normal handheld photography, stabilizing the image on two axis (this was the only mode on the G1). Mode 2 is designed for panning with a moving subject with one axis of stabilization provided. Mode 3 is designed for photographing erratic action such as sports. In mode 3, when the shutter release is half-pressed, VC activates but does not stabilize the image until the shutter release is fully pressed, meaning that the lens does not compete with subject framing adjustments and that drifting of the frame is not a problem. The stabilized viewfinder, however, is given up with this option. Handheld video recording is nicely assisted by VC. VC also provides a still subject to the camera's AF system, permitting it to do its job better. With the optional accessory Tamron TAP-in Console (more about this later), you can customize the configuration of VC MODE 1. Choose the viewfinder view of either standard or image priority. I mentioned in the beginning of the review that Tamron claims "enhanced optical performance" from the 70-200 G2. In the first set of comparisons below, we see the optical designs of each lens and there does appear to be a change including an additional LD element. In the second and third comparisons, we look at the theoretical MTF charts for 70mm and 200mm with higher lines representing better image quality. Here we also see a difference and as expected, it is an improvement with results at 70mm appearing to be especially improved in the periphery. 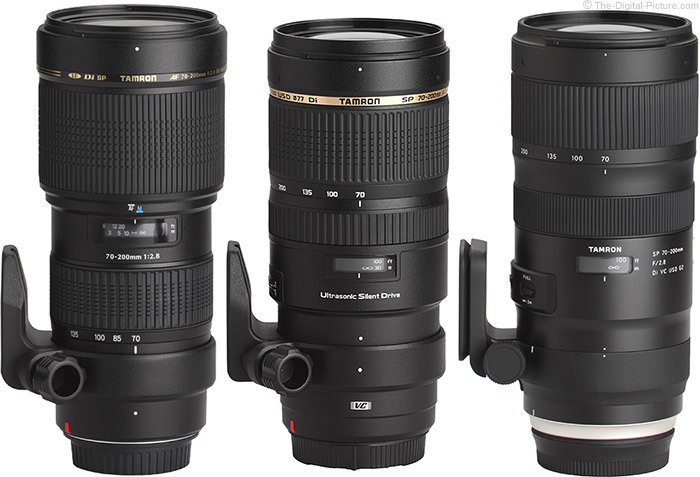 Looking at real life performance, we find the Tamron 70-200mm f/2.8 Di VC USD G2 Lens delivering superb image quality. In summary, at f/2.8, this lens delivers sharp images with mid and full frame peripheral performance being especially remarkable. Stopped down to f/4, results are razor sharp from corner to corner over the entire focal length range even on full frame cameras. To break down that summary into more granular chunks ... the 70mm results fit the summary well. The f/2.8 results at 100mm are rather similar to those at 70mm with the center being very slightly less sharp and the periphery being very slightly sharper. The center of the frame f/2.8 results are sharpest at 135mm and the periphery shows a slight improvement f/4. The center of the frame results are weakest at 200mm at f/2.8 and more improvement is seen at f/4 at this focal length, but the periphery is very sharp at 200mm f/2.8. Following are some outdoor comparisons captured with a Canon EOS 5Ds R. These 100% resolution cropped images were captured in RAW format and processed in DPP using the Standard Picture Style with sharpness set to "1". 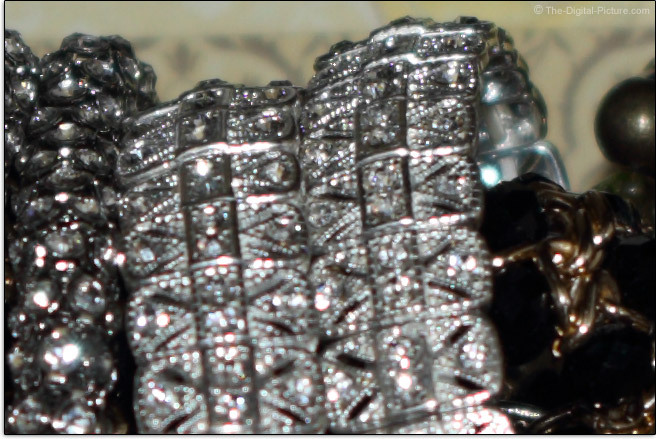 The following examples are from the center of the frame. Look for the sharpest portion of the frame at f/2.8 showing the least change at f/4 to find the center of the plane of sharp focus. At 70mm, a bump in contrast is seen at f/4. At 100mm and 135mm, little difference is seen. And, at 200mm, we see a noticeable difference at f/4. While the mid focal lengths do not show focus shift of significance, some is apparent at 70mm and at 200mm it becomes even more noticeable. I would rather there be no such shift, but the intended plane of sharp focus remains in focus at narrower 200mm apertures and that is an important point to make. We'll take a closer look at the extreme full frame corners next. The top-left corner is shown in the 70 and 100mm examples and the 135 and 200mm samples feature the bottom-left corner. This reviewed lens showed very good overall optical alignment, so the selected corners mean little aside from knowing which corner of the crop is the absolute corner of the frame. As always, vignetting affects wide open aperture corner brightness and contrast, but otherwise, these corners are looking very nice. Keep in mind that longer focal lengths magnify any heat waves present more than shorter focal lengths and narrower apertures mean longer exposures which give those waves more time to impact the image. While these images were captured late in the day, the 200mm f/4 and f/5.6 results were not looking representative to me and I chose to not show them. 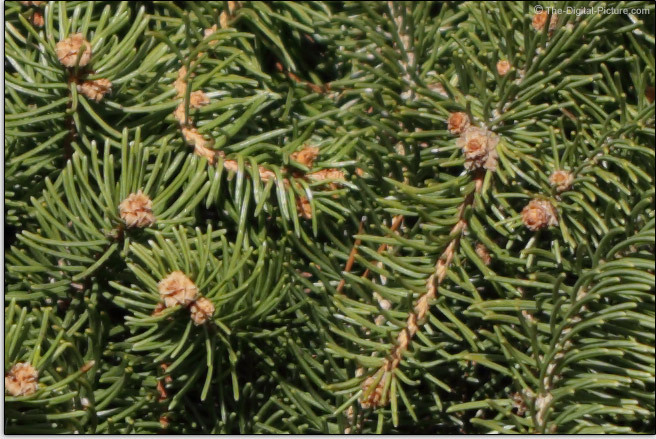 I mentioned vignetting – it is always present in wide aperture corners unless using a camera that does not include the entire image circle (an APS-C model in this case). At f/2.8, this lens shows about 2 stops of shading in the corners with about 1/2 stop more at 200mm and 1/2 stop less at 100mm. The rule for reducing vignetting is to stop down the aperture. At f/4, about .8 stops of shading shows in the wider focal length corners and just slightly more (just over a stop) shows in the longer half of the range. By f/5.6, it is very unlikely that vignetting will be visible in images and it continues to be reduced further as the aperture is narrowed. As hinted to, images captured with APS-C format cameras do not show shading nearly as readily and the barely-recognizable close-to-1-stop of shading in 200mm corners is essentially the only consideration in this regard. With sharpness and vignetting covered, let's look at other factors that can affect image quality. If all of the wavelengths of light in the visible spectrum refracted identically, a lens designer's job would be a lot easier. Because they do not, we get aberrations caused by various wavelengths of light being magnified and focused differently. The most frequently noticed type of CA (Chromatic Aberration), lateral (or transverse) CA, shows as different colors of the spectrum being magnified differently with the mid and especially the periphery of the image circle showing color fringing along lines of strong contrast running tangential (meridional, right angles to radii) as this is where the greatest difference in the magnification of wavelengths exists. I'll call it "LatCA" and if it is a zoom lens, latCA is nearly always present in some amount. Fortunately, lateral CA is easily software corrected (often in the camera) by radially shifting the colors to coincide. Also fortunate is that this lens performs relatively well in this regard, avoiding much of the color fringing. The extents of the zoom range typically show the most LatCA and that is again the case with this lens. These amounts are visible in some images, but they are not terribly strong. 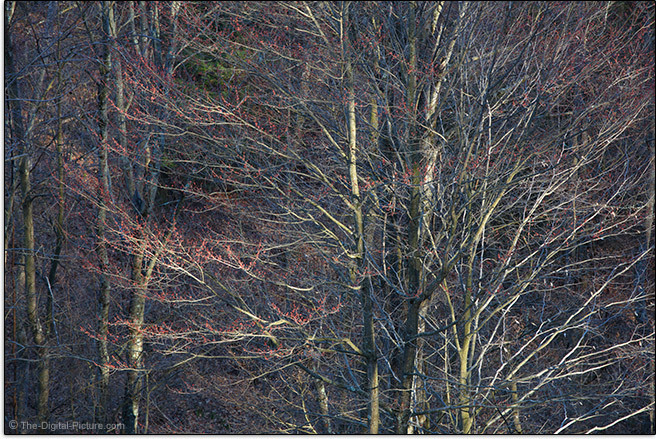 Some color fringing remains present at 100mm, but the 135mm result appears very nice. That the foreground and background specular highlights shows different surrounding colors indicates that these issues are present at f/2.8, though in a small amount. These issues are essentially resolved by the time the aperture is stopped down a couple of stops. Put a bright light source such as the sun in the corner of a telephoto lens frame and some effects of flare are going to be seen. Put the bright light source into a complex, high-count lens element/group design and some effects of flare are going to be seen. Put the two together and stop down to a narrow aperture for some wild flaring effects. Even so, this lens performs among the best in its class in this regard. Linear distortion is another attribute practically guaranteed to be present with a zoom lens and though there again is some, this lens performs well in this regard. With straight lines running along the edge of the frame, 70mm will show some modest barrel distortion curving those lines outward in the center of the frame. 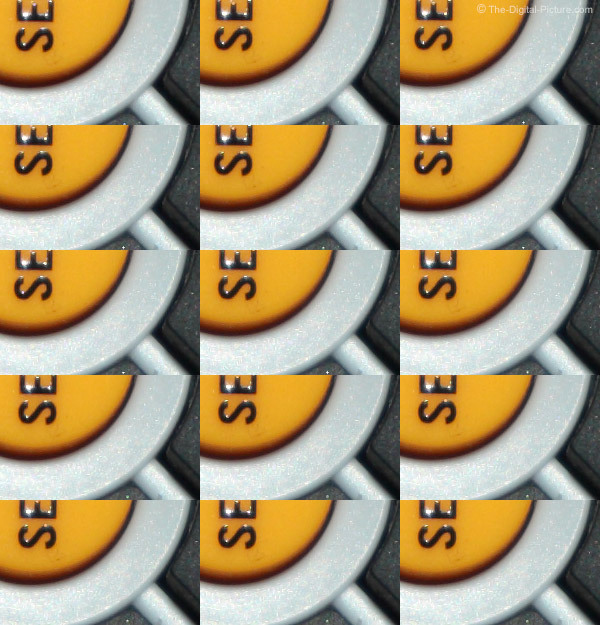 Zooming in, the barrel distortion transitions through negligible distortion and by 100mm, very slight pincushion distortion is present. The pincushion distortion gradually increases until 200mm where a modest amount shows. 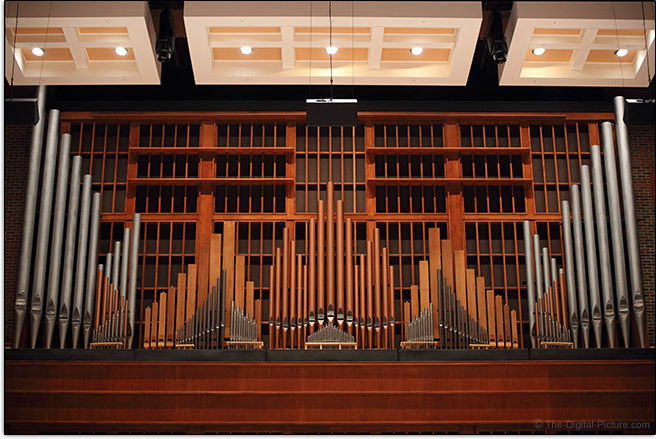 The following organ pipe images are un-cropped and reduced, showing distortion at the top and bottom of the frame as well as another focal length comparison. 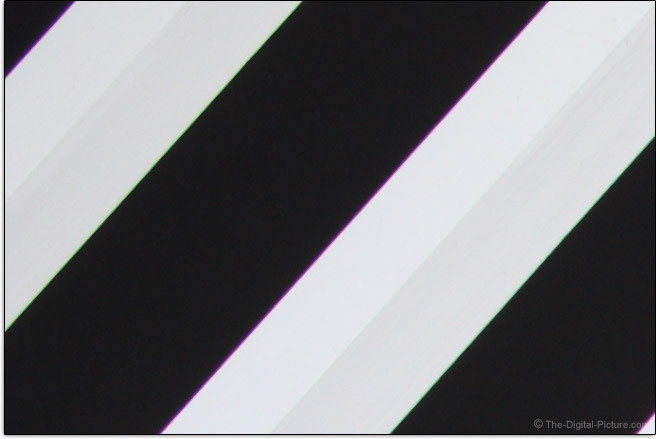 The straight lines along the horizontal edges of this image should remain parallel to the borders. While that is not always the case, this lens does not perform poorly among its peers. With long focal lengths and a wide aperture, that this lens can create a strong background blur is unquestionable. The quality of that blur, referred to as bokeh, is also good. 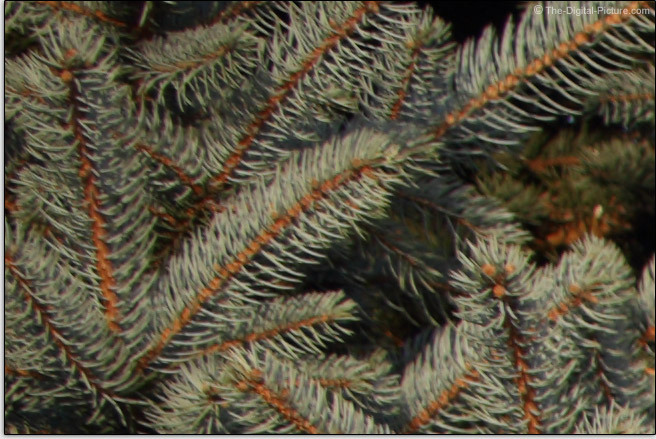 Here are some f/5.6 examples of out-of-focus specular highlights. With 9 rounded aperture blades, this lens will create 18-point starbursts from point light sources when narrower apertures are used (f/16 in this case). Overall, this lens is delivering best, or at least nearly best, image quality in its class. 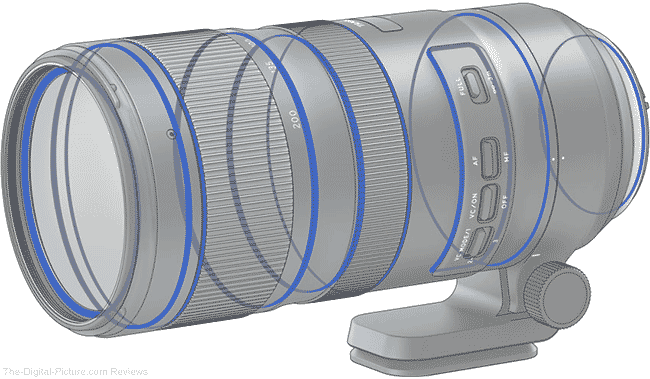 As indicated by the "USD" acronym in its name, the 70-200mm f/2.8 VC Lens uses Tamron's very nice Ultrasonic Drive for autofocusing. This implementation of USD is quiet in operation, with only a light "shhhh" heard in quiet environments. The focus speed is decent and fine-tuning adjustments made after the initial near-in-focus state is achieved are seldom encountered. This lens simply locks on the subject, getting it right in the first try, time after time. In this review's introduction, I mentioned that Tamron promised "faster AF speed and accuracy". One of the lens aspects I always test thoroughly is autofocus accuracy with consistency being especially important as consistency can be calibrated into accuracy if necessary. And, I generally dread testing 3rd party lens AF accuracy because ... historically, many of these lenses have performed poorly in this regard. It is highly frustrating to spend weeks evaluating a lens and have the AF results reveal a flaw large enough to make people no longer interested in it. I've shown that the Tamron 70-200mm f/2.8 Di VC USD G2 Lens has impressive sharpness even at its widest aperture. But of course, that sharpness can only be realized if the lens is focused accurately and most of us rely on AF for that task. And, with the relatively shallow depth of field this lens can produce at 200mm and f/2.8, that aspect becomes even more critical. The image shared above is a collage of 100% crops taken from 15 consecutive 200mm, f/2.8 autofocused images, each captured with the lens initially de-focused. If I hadn't told you, you might have thought that I simply copied and pasted a single image to create this graphic, but those are indeed 15 different images. That's impressive. And, I have a variety of similar tests showing similar results. I had a track meet to photograph and ... I really wanted to see how this lens would perform in that role. The Tamron 70-200 made it into my hands just as I was leaving for the event and, (I don't recommend doing this, but I couldn't help myself) without any prior testing, I mounted the lens on a Canon EOS-1D X Mark II and went out the door. I shot the meet solely with this lens (frequently verifying the results between heats – just in case there were serious issues). The results from about 1,000 images captured that evening were not perfect (they never are), but they showed this lens' AF system performing quite well. That I photographed this event in low light, including heavy cloud cover and light rain with a post-sunset finale, gives the results added value. I often notice peripheral AF points not performing as well as the center AF point when using third party lenses, so I also test those. While the peripheral AF performance from this lens falls short of the center AF point performance, it is only very slightly less so, delivering a significant majority of in-focus images, including at the mentioned track meet and even in the very low light levels at that event. 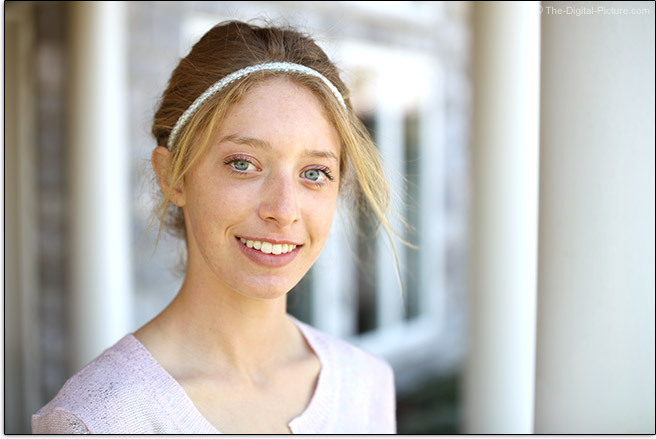 A vast majority of the results from a portrait session with this lens, including tightly-framed head shots and utilizing only peripheral AF points, were correctly focused. Overall, I'm quite impressed with the Tamron 70-200mm f/2.8 Di VC USD G2 Lens' AF performance. This lens focuses internally and FTM (Full Time Manual) focusing is supported. A focus limiter switch provides the full focus distance range or optionally limits the focus range to between 9.84'(3m) - ∞, for potentially faster focus acquisition. Using the Tap-In console, the limited focus distance switch position can be customized to any available focus distance range. From 70mm through 135mm, subjects retain their similar size throughout a full focus extent change, though there is a noticeable size change at the longer focal lengths. Photographers using focus stacking techniques, videographers pulling focus and anyone very-critically framing a scene will appreciate the 70-135mm range for their purposes. Focus distance settings are displayed inside a small window and available at a glance. Not unusual for a lens in this class is that DOF marks are not provided. While non-cinema lenses are generally not parfocal and that attribute can be individual lens-specific, the review lens is not parfocal. 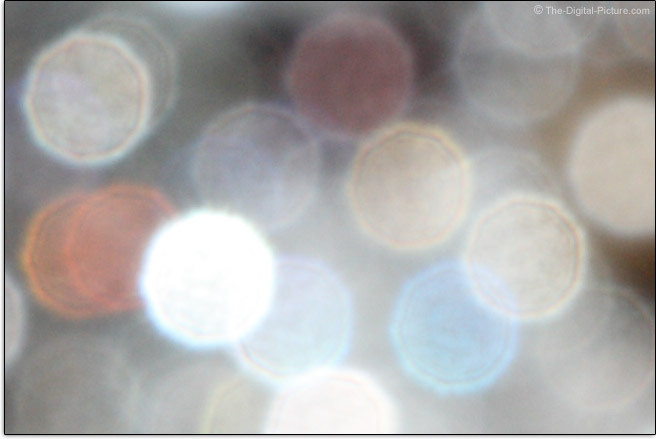 However, subjects do not go far out of focus during a full extent zoom. Still, plan on refocusing after a focal length change. The manual focus ring is very smooth with ideal dampening. The 146° of focus ring rotation is ideal for precision work at 70mm with adjustments happening slightly fast at 200mm, though not problematically so. The subject framing always remains nicely centered for a good overall manual focusing experience. The focus ring being positioned to the rear of the zoom ring is not my preferred design. Tamron's first 70-200mm f/2.8 Di Lens (we'll call it the G0) included the term "Macro" in its name. While I wouldn't deem it a true "macro" lens, it did have a very-high-for-a-zoom-lens 0.32x MM (Maximum Magnification) spec. The G1 dropped the macro designation and the MM spec also dropped to a rather low 0.13x. While I still don't consider a 0.16x MM very high, the G2 has been improved over the G1 in this regard (our tests show that the G2 can be focused even closer than its spec indicates) and this difference can be all that is needed for tightly framed headshots and similar. 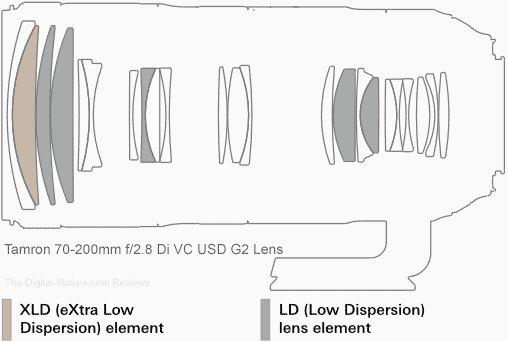 Following is a comparative look at the specs of some similar lenses. Interesting is how the different MFDs relate to the different MMs in this list. A sure sign that spring has arrived is when the snakes come out. After bringing this cute little ring-necked snake into the house for my daughter (don't worry, she loves snakes), she thought it might be more attractive in a flower setting (likely most would agree). 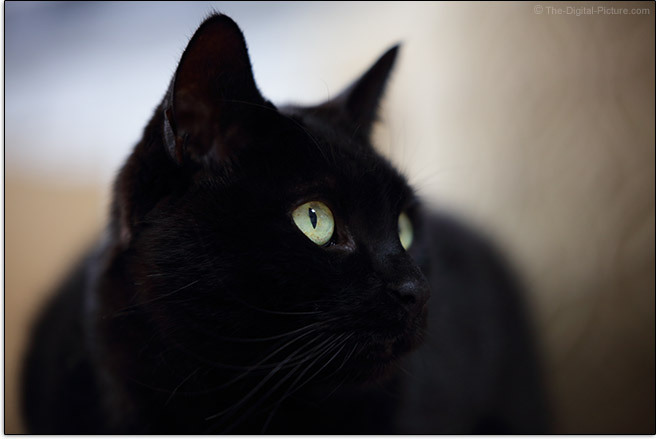 I thought it might be another opportunity to use the Tamron 70-200 G2, this time demonstrating its MM capabilities. This image was captured at 200mm, f/2.8 at the lens' MFD. 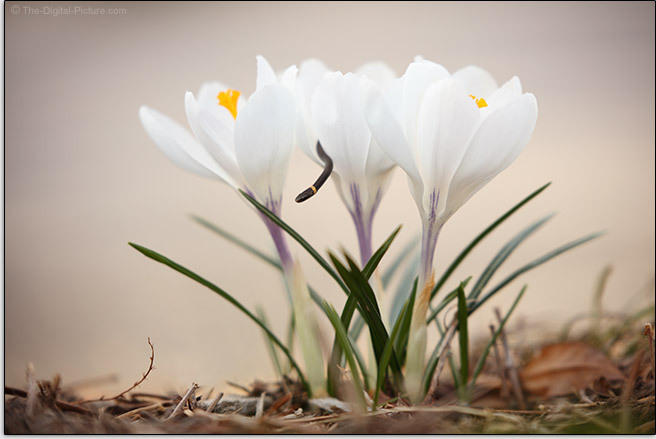 The crocus flowers are about 5" (127mm) tall. This image again nicely demonstrates this lens' ability to erase the background details. You probably wouldn't guess that the background is an asphalt driveway if I didn't tell you. The flowers were in the cool-toned shade and the driveway was being lit by warm-toned late-day sunlight. To reduce the MFD and thereby increase the MM, mount an extension tube behind this lens. Infinity and long distance focusing are sacrificed with an ET in use, but some modest MM increase can be realized using ETs behind this lens. 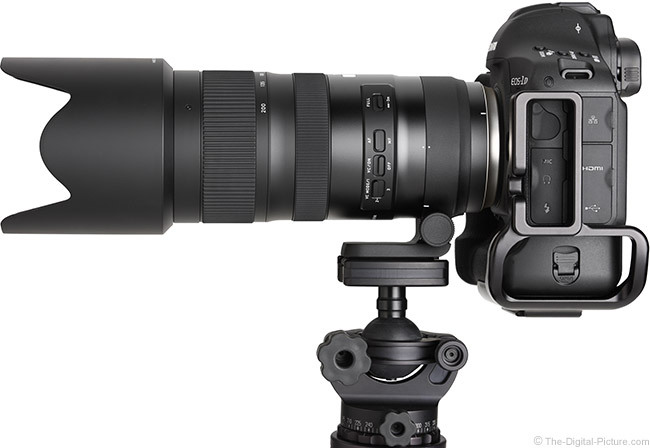 New with the Tamron 150-600mm f/5-6.3 Di VC G2 Lens was a pair of, initially, dedicated teleconverters. The good news is that these teleconverters are no longer dedicated because they are also compatible with the 70-200 G2. The TCs feature 1.4x and 2.0x magnifications of the original focal lengths while retaining the original MFD, which translates directly into 1.4x and 2x higher MM specs. The addition of a Tamron TC-X14 1.4x Teleconverter creates an attractive full frame 98-280mm VC lens with a 1-stop narrower max aperture (f/4). While the focal length versatility provided by the TC is very nice, magnifying the image by 1.4x does not go unnoticed in the image quality. However, stop down to f/5.6 or f/8 and the results are looking nice. While this lens is modestly sharper wide open at wider-than-200mm focal lengths and the with-extender results will appear similarly improved at these focal lengths, the reason for using an extender is to gain a longer focal length than is natively available in the lens and that means any with-extender focal length below the 143mm focal length mark can be better-served without the extender in place. There are times when the full with-extender focal length range is desired, but the most focal length increase with a teleconverter is obtained at the 200mm setting. Thus, I feel that the with-teleconverter results at 200mm are the most important to consider. The TC-X14 1.4x increases LatCA modestly and has a negligible effect on linear distortion. With the TC-X14 mounted behind the 70-200 G2, autofocus speed remains good and I encountered no focus hunting in even low light conditions. Use the Tamron TC-X20 2x Teleconverter to create a 140-400mm VC Lens with 2-stops of aperture loss. Fortunately, even with a 2-stop max aperture reduction, this is still a very-reasonable-for-400mm f/5.6 max aperture lens. I am seldom enamored with the performance of 2x teleconverters and you will not likely find the 400mm f/5.6 image quality acceptable. However, stop down to f/8 or f/11 and ... the results are not bad at all. And, f/8 is wide enough and still very useful for the wildlife and sports photography that these focal lengths are especially well suited for if the lighting conditions are relatively bright. With the 2x TC mounted, LatCA is increased slightly and the natively present modest 200mm pincushion distortion is essentially erased. 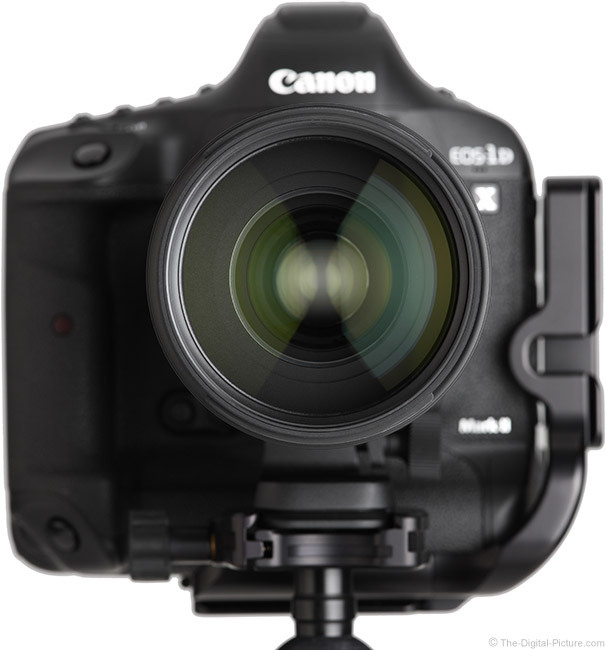 With an f/5.6 max aperture, this combo will still autofocus on any DSLRs using conventional phase detection AF. While the 2x has a slight impact on AF speed, it is relatively mild and I again encountered no focus hunting in even low light conditions. This is the second Tamron "G2" lens I've reviewed (the Tamron 150-600mm f/5-6.3 Di VC USD G2 Lens was first) and I continue to appreciate the modernized design of these lenses. From the streamlined shape to the multiple shades of matte black finish to the modern font used for the markings, this lens looks great and feels just at least as nice. 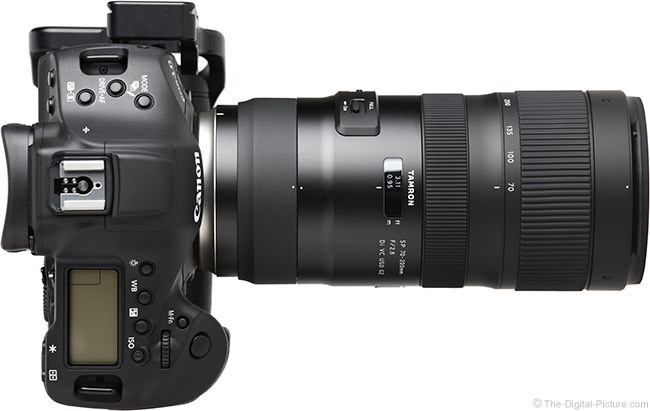 As mentioned at the beginning of the review, this G2 is Tamron's third version of the 70-200mm f/2.8 Di Lens. Here is a look at these three lenses, showing obvious progression in styling. Remember the old push-pull manual focus engagement system? The G0 had it. Featuring USD AF, the G1 gave up that feature and likely no one misses it. The G2 takes this lens design to a new level and being great-looking is just one aspect of it. The lens seems quite well built with a high quality feel and the metal exterior of the main body aids in this. As is common with lenses of this class, the Tamron 70-200 G2 does not change size when zooming. The zoom and focus rings rotate in the Nikon-standard direction, opposite of the Canon standard and Canon shooters will need to acclimate to this directional change. It is not natural for us to go the other direction. Notice where the zoom ring is positioned relative to the tripod ring foot? The foot is the balance point of the lens with camera mounted (or close to it). Generally, I prefer to hold a lens at the balance point with my left hand while photographing handheld. The foot rotates out of the way (or can be removed), so that feature is not a problem (and the low profile foot also provides a nice grip location). But, I am not able to reach the zoom ring with my fingers from this position. While it is easy to reach the focus ring with my left hand holding the lens balanced, I am much more frequently using the zoom ring when handholding the lens, such as when tracking a sports subject. I let the camera handle the focusing task while I concentrate on framing. Unfortunately for zoom-ring-forward large lens designs such as this one, the lens needs to be held forward of the balance point and that means the right hand must assist with grip and support, and that is not optimal. When shooting from a tripod or monopod, the zoom ring location is not an issue. The zoom ring location is also a non-issue if focal length adjustments are not needed or not needed in haste. From the positive side, the zoom ring is nicely sized, quite smooth and zooms at a relatively fast rate. This is a weather-sealed lens with gasketing illustrated above and the rear mount gasket shown below. The front element is fluorine-coated to avoid dirt adherence and to make cleaning very easy. A 70-200mm f/2.8 zoom lens requires a lot of heavy lens elements and a significant-sized frame to house them. That translates to a substantial overall size and weight. While the G2 is chart-topping for its weight, it is only very slightly heavier than every other lens in its class and it is also similar to the rest in size. For many more comparisons, review the complete Tamron 70-200mm f/2.8 Di VC USD G2 Lens Specifications using the site's Lens Spec tool. When using any one of these lenses, you will know that there is something in your hands and, if you use one for several hours at a time, you will likely have tired arms and shoulders afterwards. Still, these are one of the most useful classes of lenses available and ... they are worth the effort to use. 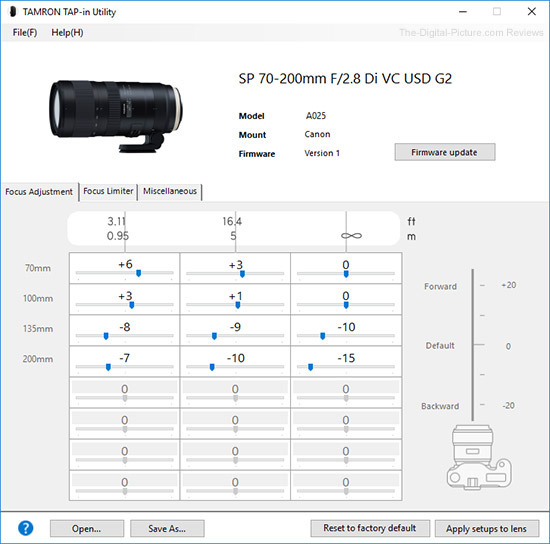 Use the site's product image comparison tool to visually compare the Tamron 70-200mm f/2.8 Di VC USD G2 Lens to other lenses. 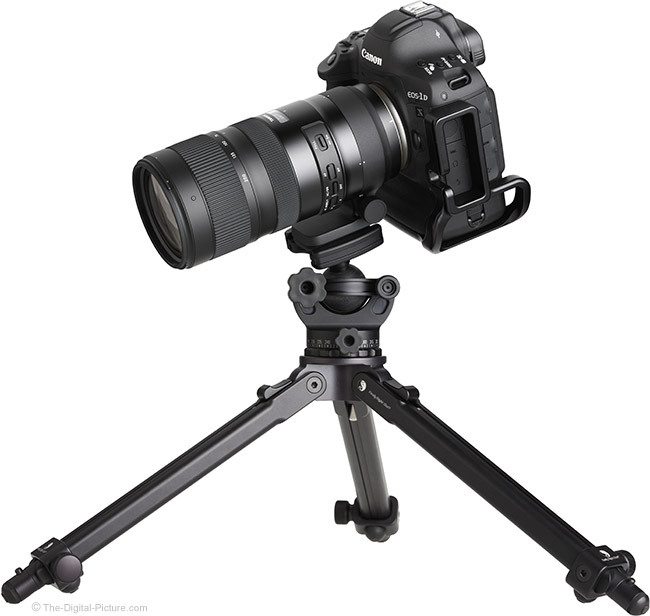 A lens of this size and weight creates a very front-heavy situation for a tripod-mounted camera. Thus, all 70-200mm f/2.8 lenses I've used came with a tripod ring included, providing a balanced attachment point. The G2 sports a very compact, lightweight, yet quite rigid (important) magnesium tripod ring design with a feature that especially stands out: it has a built-in universal lens plate. No longer must an accessory plate be acquired for this purpose and the lack of a plate keeps the lens especially compact. The tripod ring has decent smoothness if not loosened too much (some wobbling otherwise comes into play), though this attribute is hindered by some bumping felt from the removal feature's slots at certain points in the rotation. There is little or no slip-stick felt even when locked nearly tight. To remove the tripod ring, remove the lens from the camera, loosen the lock screw, align the marks and slide the ring from the mounted end of the lens. I did not find it necessary to remove this tripod ring as it has a very low profile and I found that rotating the foot out of the way was sufficient. That this tripod ring weighs only 3.7 oz (105g), (down from 6.5 oz / 185g), means the weight of the ring is a minimal factor in this choice. From viewing the above chart, one may think that 77mm filter threads are a requirement on this class of lens as they all feature this thread size. While this is not the smallest filter size available (and larger generally means more expensive), that so many lenses utilize 77mm threads increases the probability that filters can be shared. Tamron, as usual, includes the lens hood in the box. This is a relatively large, semi-flexible, ribbed-interior, plastic hood with narrow dimensions that keeps the overall dimensions compact even when reversed. 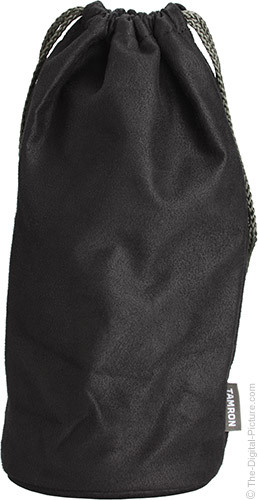 Tamron includes a suede-like lens pouch with a rigid/padded bottom. While this case offers some protection from dust and scratches, another option should be considered for impact protection. Lowepro's Lens Cases are one of my favorite choices for single lens storage, transport and carry. 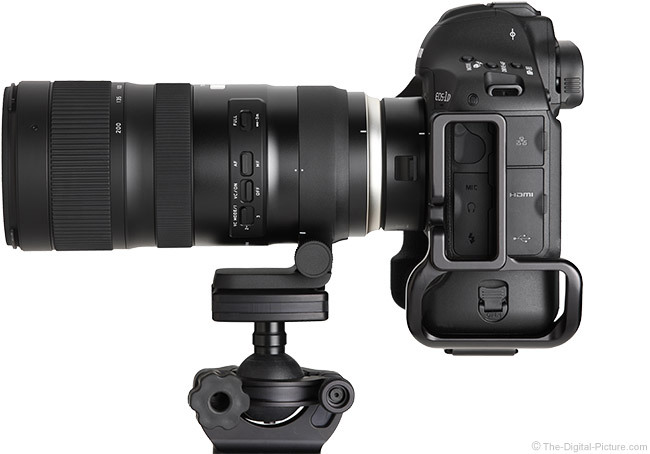 The Tamron 70-200mm f/2.8 Di VC USD G2 Lens is compatible with the Tamron TAP-in Console. The TAP-in Console is basically a USB dock in the form of a robust lens mount cap with electrical contacts and a USB port that enables the lens to be connected to a computer. Once the lens is attached to the dock and the dock attached to the computer, the TAP-in Utility software app communicates with the lens and then checks for any available firmware updates. If an update is available, a dialog box is presented, providing the option to update the lens. There have been a number of Tamron lens firmware updates released recently, addressing compatibility and other issues. Having the TAP-in Console makes those updates very fast and easy, especially compared to the alternative of shipping a lens to a service center. Within the TAP-in Utility app, most will find the first tab, Focus Adjustment, to be the most important. Autofocus adjustments can be made at 4 focal lengths with 3 focus distance adjustments available at each focal length for a total of 12 adjustments available (I made up the adjustment numbers in the example shown above). The focus Limiter tab provides the ability to customize the autofocus distance range (for the non-full-range switch position only). 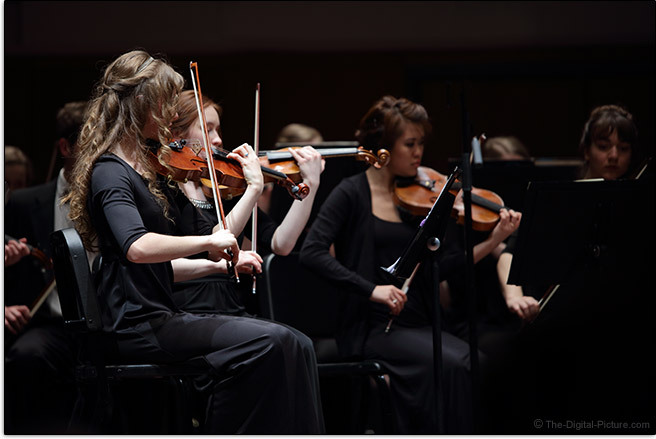 The last tab, Miscellaneous, provides control over full time manual focus override and the VC mode. When you compare the performance of this lens to the Canon and Nikon alternatives and then compare the prices, the Tamron G2 appears to be a good deal. While it is not a cheap lens, when the usefulness of the 70-200 G2 is considered, the price tag again seems quite value-oriented. The Tamron 70-200mm f/2.8 Di VC USD G2 Lens is available in Canon EF (reviewed) and Nikon F mounts. My standard disclaimer: There are potential issues with third party lenses. Since Tamron reverse engineers (vs. licenses) manufacturer electronics and algorithms, there is always the possibility that a DSLR body might not support a (likely older) third party lens. Usually a lens can be made compatible by the manufacturer via a firmware update, but this cannot be guaranteed. 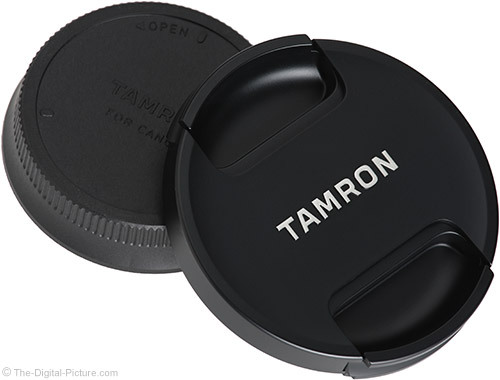 Compatibility with the Tamron Tap-In Console is risk reducing as Tamron can release firmware updates for console-compatible lenses. Tamron USA's limited 6-year warranty is superior to most. 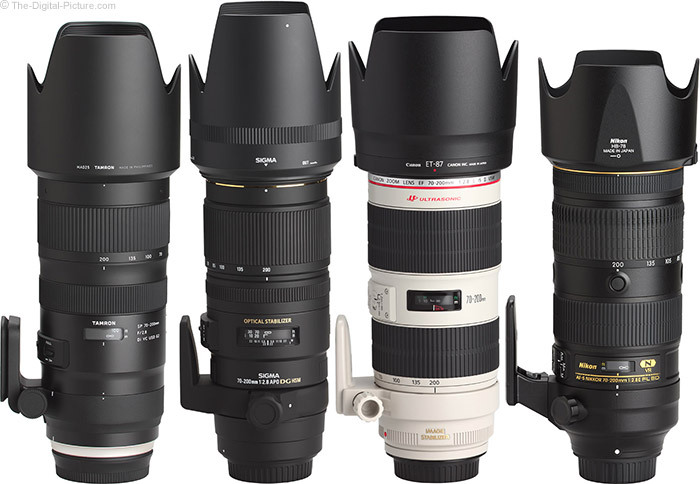 The biggest lens manufacturers all have 70-200mm f/2.8 lens models in their lineups. The standout differences are that the Canon option costs about 50% more and the Nikon and Sony options are about 2x as expensive. And, that immediately places one big decision factor squarely in the Tamron G2's favor. 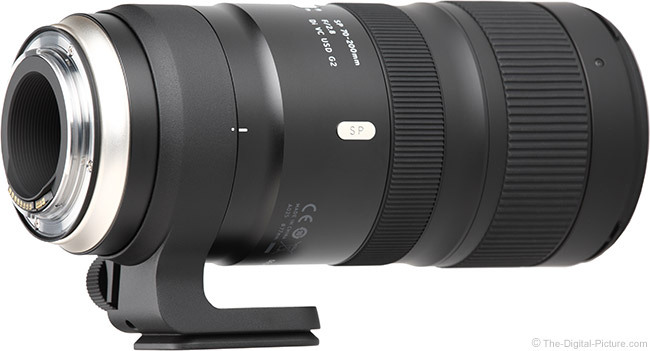 Sigma's current option is similar in price to the G2 and, at least as of review time, the Tamron G1 and G0 both remain available with lower price tags. At review time, the Tamron G2 is the only option compatible with a USB dock and the only option featuring Mode 3 vibration compensation. The Tamron G2 also has a 1-stop higher-rated VC system than the other stabilized models. Sigma's current option is similar in price to the G2 and, at least as of review time, the Tamron G1 and G0 both remain available with lower price tags. For a majority of this site's readers, the Canon EF 70-200mm f/2.8L IS II USM Lens is the first choice comparison. This is a great lens that I use a lot. In the Tamron G2 vs. Canon IS II image quality comparison at f/2.8, the Canon is generally slightly sharper in the center of the frame (especially at 70mm and 200mm) and the Tamron is slightly sharper in the periphery. Results are more similar at f/4 with the Tamron continuing to hold the edge in the corners. The Canon has less vignetting. Per the previous discussion, the Canon's zoom ring is positioned behind the focus ring, making the lens easier to zoom during handheld use. Canon is the only 70-200mm lens maker to provide this design. The Canon has one less aperture blade (8 vs. 9), has a 1" (25.4cm) wider focus ring and has a higher MM (0.21x vs. 0.16x) at a longer MFD (47.2" vs. 37.4" / 1200mm vs. 950mm). A majority of Nikon camera owners will be making the Nikon 70-200mm f/2.8E AF-S FL VR Lens their primary comparison choice. These two lenses are rather similar from a sharpness perspective, but the Nikon shows more f/2.8 color aberrations in our lab test results. The Nikon has slightly less vignetting and has a higher MM (0.21x vs. 0.16x) at a longer MFD (43.3" vs. 37.4" / 1100mm vs. 950mm). The Nikon's focus ring is twice as wide and unique to this class of lenses is that the Nikon has focus-stop buttons. 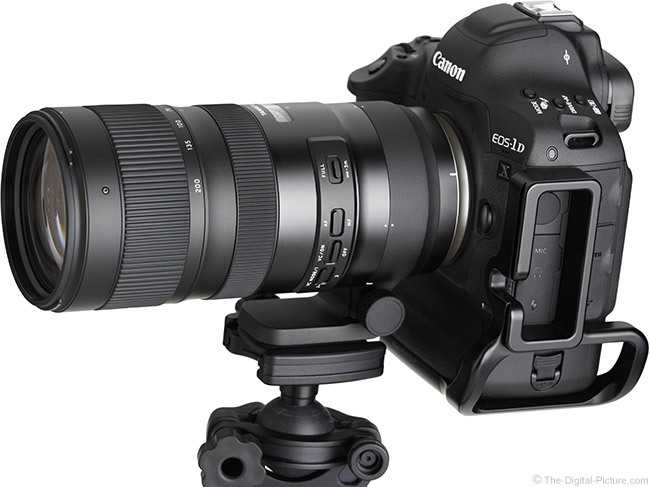 On price par with the Tamron G2 is the Sigma 70-200mm f/2.8 EX DG OS HSM Lens. In the Tamron G2 vs. Sigma EX DG OS Lens comparison, the Tamron proves itself substantially sharper and especially so in the periphery. The Sigma shows slightly more flare and has a modestly lower MM (0.13x vs. 0.16x) at a longer MFD (55.1" vs. 37.4" / 1400mm vs. 950mm). The Sigma does not have a focus limiter switch, is slightly lighter (1375g vs. 1540g) and is not weather sealed. It seems logical that the Tamron 70-200mm f/2.8 Di VC USD Lens will be discontinued with the arrival of the G2, but at least initially, it is still available. Though the list price remains the same, a significant instant rebate makes the G1 worth considering for those on a tight budget. In the Tamron G2 vs. G1 comparison, we find the G1 holding up well in comparison, but it is still bested by the G2, especially in some of the peripheral comparisons. The G1 has a modestly lower MM (0.13x vs. 0.16x) at a longer MFD (1.2" vs. 37.4" / 1400mm vs. 950mm) and has no focus limiter. The G2 has many other advantages including a modernized design and improved AF system. Surprising to me is that the 9-years-older Tamron 70-200mm f/2.8 Di Macro Lens is still available and it is priced considerably lower. In the Tamron G2 vs. G0 comparison, we find the G0 competing well at 70mm, but not very well in the mid and periphery at the longer focal lengths. 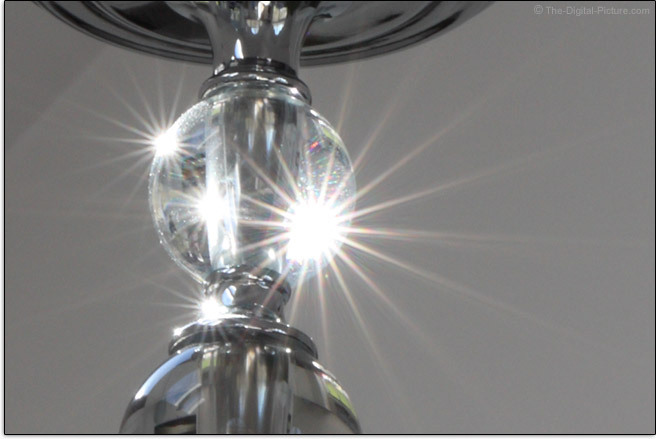 The G2 shows less flare and slightly less flare at 70mm. The G0 has no weather sealing, no VC and a much older design. The G2's improved AF system alone is quite valuable. 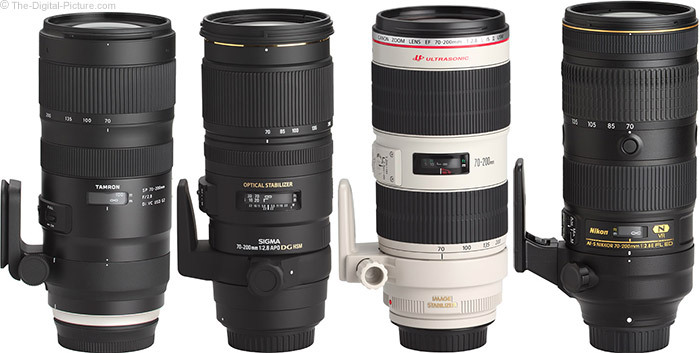 Most will find an optically stabilized 70-200mm f/2.8 lens filling a crucial role in their kits. This class of lens is one of my most-used and most-important. While I take camera and lens marketing statements with a grain of salt, Tamron in this case delivered on the "... enhanced optical performance, improved VC (Vibration Compensation), faster AF speed and accuracy, and shortened MOD (Minimum Object Distance) ..." promise. 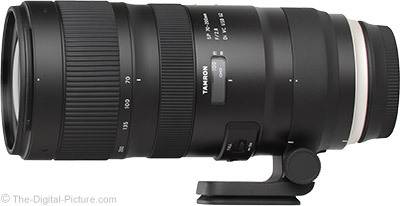 The Tamron 70-200mm f/2.8 Di VC USD G2 Lens design is both visually attractive and functionally very nice. This lens delivers accurate autofocusing and remarkable image quality for an ideal combination that translates to dependably great results. The low price will seal the deal for many. * Buy Now - $100.00 rebate available from ?